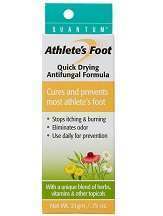 Basic Information: What is Athlete’s Foot Quick Drying Antifungal Formula? Beneath you will see a review of Quantum Athlete’s Foot Quick Drying Antifungal Formula. This foot mask is comprised to heal most instances of Athlete’s Foot in days by killing fungus and eliminating bacteria that cause odor. It is also meant to relieve the itching and burning sensations that commonly accompany the condition. By reading on, you will be made aware of this mask’s ingredients and what our assessment of it is. Tea Tree Oil is used to treat the athlete’s foot and is meant to be equally effective at dealing with it as clotrimazole. Menthol is a pain reliever that also causes body cells to constrict. Oregano Oil, Citric Acid, Echinacea Extract and Sea Kelp also cause cells to constrict as well as being antiseptics that can protect the skin. Tolnaftate is an antifungal that will kill off the fungus that causes a case of Athlete’s Foot. Stearic Acid is a skin softener. Apply twice per day after having washed and rubbed the area that has been infected dry. Allow a few minutes for the mask to dry and adhere to the skin. Particular attention should be paid to the spaces between your toes and you should be diligent in changing your socks and footwear on a regular basis in order to clear up your infection more quickly. Quantum sells a 21g tube of their quick drying antifungal for $11.99. As this can be obtained from them online, a delivery charge will also be added at the time of purchase. If you place an order with this company for an amount over $54.99 then you will have free standard shipping on your order. It might be possible to purchase the product at a cheaper rate elsewhere but then you forgo the possibility of a guarantee from Quantum. There are also some Quantum Health stores where you may be able to buy this item. You should expect a product that has a nice texture, a mild smell and one that manages to stay on all day. The product does work but I became aware that it was very slow to get rid of my athlete’s foot infection. I am not the first person to have these results and it seems to take a few weeks of use and then a week or so of weaning yourself off it before you can be certain that you are clear of your infection. It brings relief from the very first application, a few days in it gets rid of the pain and a few days longer before the healing process begins. You have to keep using it after the skin seems fully healed over to prevent infection reoccurring so will be have to keep using it for about a month. It is gentle on the skin and it does get rid of the athlete’s foot eventually. It provides relief so it is a good product to use. However, a single tube does not last very long, maybe a week so you will have to buy more of it to rid yourself fully of an infection. As with all products, if you experience any sort of reaction then you should discontinue its usage and consult your physician. Quantum Athlete’s Foot Treatment mask is no different. If your symptoms persist after having used the product for four weeks then you should also see your physician for medical advice. You must not allow it to encounter your eyes, or use it on your child if they are under the age of two unless directed otherwise by a doctor. It is worth noting that the product may degrade after opening and some of the ingredients may separate. It seems to be able to break down into a cream and a runny liquid but it may be possible to mix the ingredients together again. Quantum has a 30-day return policy. If you are unsatisfied with the product for any reason then you may arrange it to be returned within 30 days of purchase. You are asked to ring customer service so that you can find out where to send the product and to organise a refund or exchange. The toll free number is 1-800-448-1448 and you should ask for extension 101 in order to be put into contact with customer service. It is not stated what condition the product can be returned in. It may be possible to return the mask after it has been opened but this is a question best asked of one of the company’s customer service representatives. If the product is damaged or defective when it arrives then you are asked to ring the same number listed above and a replacement will be arranged. You are asked to keep the product and contact them within 24 hours of its arrival or on the next business day. After reading various reviews, this product seems to have earned mixed views. Some people are extremely happy with the product, particularly its daily durability and its more natural ingredients compared to other treatments. However, others were displeased with the slow success of the treatment and the instability of the product’s formulation. Ultimately, Quantum Athlete’s Foot Treatment Quick Drying Formula has a number of shortcomings. One tube of product does not go a long way. In order to deal with your infection, you may be forced to pay over $40 meaning that this product is poor value for your money. There may be some instability in the formula, as it seems to have the capability of separating. While the product does come with a guarantee, it is quite a short one. Considering how long it would take to properly test the treatment, 30 days is not a long enough time. In addition, as so much of the product is required, you may have already gone through two or three tubes before you determine that you are dissatisfied with it. It has also received some negative reviews so there are some customers who have found that the treatment did not suit their needs. This mask is not completely bad though. It is made with many natural ingredients and so is a nice alternative to similar products and seems to work well on sensitive skin. The mask also stays on your feet well so that it can withstand your daily routine, even if it is rigorous. It is up to you to determine if it suits your requirements and make an informed decision about whether to purchase it or not.